You can place your order by contacting us directly at the store 425-283-5445. If you receive our voice mail, please leave your name and the best phone number to contact you and one of our cupcake consultants will return your call as quickly as possible. Please do not leave your order on the voice mail system. We need to speak with you directly to ensure we have all the information to complete your order. We kindly ask for a 48-hour notice for most orders. For larger customized orders a one- week notice may be required. We will always do our best to assist you, however there may be certain requests that we may not be able to accommodate. Once you know the date that you would like your order picked up, look at our daily menu on our website. You can order from that day’s menu in any quantities that you would like. If you would like one of our flavors that we do not have on that day you can order it with a minimum purchase of one dozen regular cupcakes or two dozen mini cupcakes. There are no refunds on customized cupcakes or cakes. We Deliver! We just need a 24-48-hour notice. The minimum amount for delivery is $50.00 and there is a delivery charge that is based on the city we are delivering to. If we are unable to deliver and you are in the Bellevue area we suggest contacting Uber Eats or Grubhub. If you need to cancel your order, we kindly ask that you provide a 24-hour notice to receive a refund. We have between 10-15 flavors to choose from per day at our shop. You may select from any of these flavors during your visit. 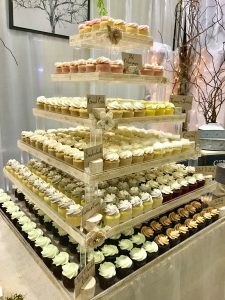 We do not limit the quantity, however all cupcakes are available only “while supplies last” therefore to ensure you have the flavors and quantities that you would like it is best to place an order ahead of time.